Breaststroke lesson - How to use your arms? It has been another long stinch of not posting, so I will try to redeem myself. :). This post will focus on how to use your arms in breaststroke. There are also a couple of videos that will demonstrate some of the info I am about to give you. If you are more interested in how to use breaststroke legs just click the link. Alright, let's start with a blackboard (see image with drawings). Breaststroke usually comprises of 4-5 phases, depending on how one thinks about it. One of the most important aspect of the breaststroke pull is that the arms move in one motion and there should be no pauses. The arms start slowly and speed up during the phases, similar to a motorcycle accelerating after standing on a red light. I will include the speed in kilometers next to the phases for better reference. During this part of the stroke, your body is the longest. Your head is between your arms, arms in a streamline and legs stretched with ankles touching. Your eyes are on the bottom. The second figure on the above picture looks like a Y. The top two lines in the Y shape indicate arms. So, what do you do? Once your arms start coming apart from the streamline position, you have to "press your chest down" and basically spread the water in front of you. Your "palms are facing outward". Your "head is still down". Then when you arms are spread apart wider than your shoulders, you need to start bending your forarms with palm starting with "your elbows locked in place" right at the surface "ahead of your shoulders". This is very important, the first part of the stroke is only in your forarms. Now, once your forarms are travelling backward, they are actually not going directly back, but moving toward your breast bone, right between your breasts. Once your fingers reach each other, "squeeze your elbows together". 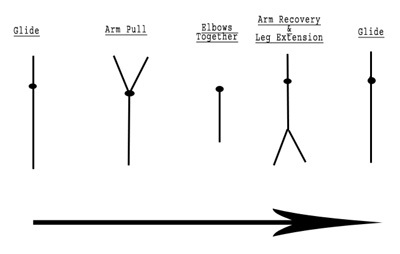 As you can see, in this phase, your body is the shortest with legs bent (more on this in the next post, let's only focus on arms here). One of the most important parts is to realize that "you should not pause in this phase". During the movement of your forearms from the extended Y position, your head is starting to come out of the water and your eyes are looking slightly forward. Once you squeeze your elbows your head is out of the water and looking somewhere in the distance where your eyes would meet with the surface of the water. Some swimmers like to keep their head down. I don't think that is wrong, it just depends how strong your legs are. Let us know watch the video. There are a few flaws in the stroke, but it is good enough to give you the correct picture. When your elbows are squeezed and you are taking a breath, it is time to reach with your arms forward along with the kick (more on this later). Your palms will naturally be facing upward when your elbows are squeezed, don't worry about this, you can rotate them while you are extending your arms forward. When entering water, watch for "not catching air bubbles in your palms". During the period the arms are going forward, the head is also moving toward the position in between the arms, so you can smoothly end up in the glide. "The arms and head stop their journey at the same time" and your body is in a nice gliding streamlined position now, eyes down and we go on to Phase 1 again. As mentioned above, the arms are moving in one motion without pauses throughout the entire stroke until they are in the Gliding phase. If you are still unsure what is should look like, please watch the best breaststroker out there. Better, yet watch him break a world record in 200 meter breaststroke. I give you the world record holder and olympic champion Branden Hansen from University of Texas. Hope you have enjoyed the journey of a breaststroke pull. Next, I will help you with the breaststroke kick - one of the toughest kicks to learn, but I have no doubt that you can do it. :) If you think you already know how to swim breaststroke, why not check out the top 5 common breaststroke mistakes post. No Comment. Just watch and learn from one of the best swimmers of all times. The Russian rocket - Alexander Popov. The ultimate sprinting machine from Russia. He used to have one of the most beautiful and most efficient strokes out there. His coach Gennadi Touretski, currently living and coaching in Switzerland is a coaching mastermind of our time and has done a tremendous job of getting Alexander Popov to be the best sprinter in the world. Alexander is a very tall guy which makes it easy to swim (same as Michael Phelps), however, his technique is what sets him apart. Watching him swim is just such a pleasure as he seems to be in this relaxed zen state of composure. Alexander Popov up close and personal only for you. When watching pay attention to his head position, body rotation, high elbow recovery, his high early vertical arm (catch) and just overall great freestyle swimming form.